On December 19th, the European Medicines Agency's (EMA's) Committee for Medicinal Products for Human Use (CHMP) recommended the stem cell product Holoclar (Chiesi Farmaceutici S.p.A.) as a first-ever medicinal treatment for severe limbal stem cell deficiency, a condition caused by physical or chemical burns to the eye or eyes in adults, which can result in blindness. The EMA has designated Holoclar as both an orphan medicine and an advanced therapy medicinal product, which enabled the manufacturer to receive free scientific advice and protocol assistance for drug development. The CHMP recommendation was based on an assessment by the expert Committee for Advanced Therapies. Such steps are taken to promote the development of medicines for rare diseases and to encourage innovative medicinal products, according to the EMA statement. Holoclar is produced by Chiesi under an agreement with Holostem Terapie Avanzate, an Italian biotechnological company devoted to the development, manufacture, registration and distribution of Advanced Therapy products based on cultures of epithelial stem cells both for cell therapy and gene therapy. Holoclar was designed specifically for the treatment of severe limbal stem cell deficiency (LSCD). 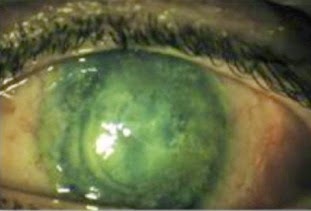 Thermal or chemical burns to the eye can destroy the corneal surface (epithelium) and the limbus, causing a deficiency of limbal cells. If this happens, the cornea is covered by a different epithelium following an invasion of cells from the conjunctiva. This process leads to neovascularization, chronic inflammation and stromal scarring, rendering the cornea opaque and results in subsequent loss of vision. Conventional corneal transplants are an ineffective treatment in such cases. The therapy is based on cultures of limbal cells taken from the patient, which, once they have successfully grafted, regenerate the corneal epithelium and restore its functions. Limbal cell cultures even allow the possibility of treating patients with a loss of corneal epithelium in both eyes, provided that a small portion of limbus remains in one of the eyes. Holoclar, is an autologous culture of limbal stem cells. It is made from a biopsy taken from a small undamaged area (minimum of 1-2 mm2) of the patient's cornea and grown in the laboratory using cell culture, and transplanted in the affected eye or eyes after removal of the damaged area. Such cultures engraft and permanently regenerate a functional corneal epithelium allowing recovery of visual acuity. 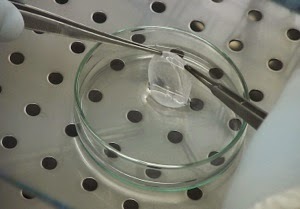 replacing damaged limbal stem cells. Holoclar can offer an alternative to corneal transplantation for replacing altered corneal epithelium in some cases, and it has been shown to increase the chances of a successful corneal transplant where the injury has caused extensive eye damage. It reduces the risk of rejection compared with transplanting tissue from a donor and does not require surgery on the patient's other eye as only a small biopsy is performed to collect the cells, thus reducing the risk of damage to the healthy eye. Therefore, Holoclar may also be suitable where both eyes are affected by moderate to severe LSCD. Limbal stem cell deficiency is estimated to affect about 3.3 per 100,000 people in the EU, causing pain, photophobia, inflammation, corneal neovascularization, loss of corneal transparency, and eventually blindness. The recommendation was made by the Committee for Medicinal Products for Human Use (CHMP) based on a robust assessment carried out by the Committee for Advanced Therapies (CAT), the Agency's expert committee for ATMPs. The Committee for Advanced Therapies and the CHMP panels determined that although the product's benefits outweigh its risks, the marketing authorization should be conditional because the data thus far are retrospective and not yet comprehensive. Therefore, the EMA says, "an additional study on the use of Holoclar should be conducted." The opinion adopted by the CHMP at its December 2014 meeting is an intermediary step on Holoclar's path to patient access. The CHMP opinion will now be sent to the European Commission for the adoption of a decision on an EU-wide marketing authorization. After that, decisions about price and reimbursement will take place at the level of each member state, taking into account the potential role/use of this medicine in the context of the national health system of that country. Update: On February 20, 2015, the EMA approved European marketing for Holoclar. Chiesi said that Holclar would be available to all suitable patients in Europe "in the near future".